We're going a different route with this than we did with the AL Playoff Preview, which took parts one, two, and three. That took us three weeks to complete, this going to be quick. Readers, please take it for what it's worth and remember: everyone has an opinion. We utilized our biased rankings and opinions, and combined them in our makeshift formula with statistics from Fangraphs and Baseball-Reference to come up with a power ranking of the four NL playoff teams. More details on the manner in which this was done can be found in the AL Playoff links above. Here are the results. The lower the number, the better we expect the team to do in the postseason. It looks to us like the two best teams in the NL are meeting in the first round between the Phillies and the Reds. 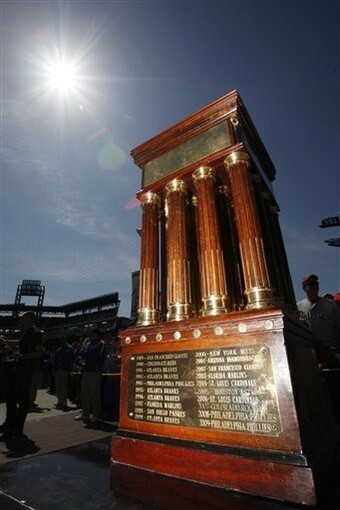 While the playoffs are a crapshoot, we may expect a Phillies/Giants NLCS. Additional analysis and details are available upon request. Enjoy the games. There is a triple-header in store for today, and the first game between the Rangers and Rays should be a delight with David Price and Cliff Lee taking the hill.